Another sector that was hit was European banks, which were headed for their worst month since May, with a total decline of 8.1% in October; the sector was down 1.1% on Friday with Italian banks the largest decliners in the Stoxx 600 Banks Index after Fitch said their rating is under pressure from sovereign-related risks. The rating agency cited risks including capital erosion due to falling sovereign bond prices, higher funding costs, and macroeconomic uncertainty. Several Italian banks were halted limit down, with all major banks sharply lower, including UBI Banca -6.2%, Banco BPM -5.5%, UniCredit -4.5%. Meanwhile, in Spain banks were also weak and remained in focus for a second day, with Bankia, Sabadell and CaixaBank among the worst performing stocks as Kepler analyst estimates €24b in potential losses following yesterday’s tax ruling. "We remain cautious with banking stocks. There are risks associated with - especially European - bank balance sheets that are very hard to asses in the long term,” Philipp Vorndran, capital markets strategist at asset manager Flossbach von Storch told Bloomberg. Earlier in the session, Asian shares traded mixed, with Japan, India, Taiwan and Australia lower, Korea and Hong Kong higher, while Chinese stocks soared after financial regulators vowed to keep risks under control. The intervention calmed markets and Chinese stocks closed up 2.6%, bucking the US trend set in the previous session. In yet another verbal intervention overnight, Chinese Vice Permier Liu He said in an interview with Xinhua News Agency that the Chinese government pays high attention to healthy, stable development of the stock market, and financial regulators have recently announced new reform measures. He said that the stock market dropped due to external factors including falling global markets, interest rates hike in major countries. He also claimed that trade frictions with U.S. have also impacted the market but psychological effect is larger than actual result. China’s efforts to halt this week's furious selloff which pushed the Shanghai Composite below the key 2,500 level and to the lowest in 4 years, came as GDP data for the world’s second biggest economy missed expectations as the trade showdown with the U.S. starts to bite, printing at the lowest level since 2009. Meanwhile, investors have a variety of other risks to pick and choose from as they wade through company earnings and grapple with Brexit, Italy’s confrontation with the EU over its budget and worsening American-Saudi relations over the disappearance of journalist Jamal Khashoggi. In FX, the dollar swung between gains and losses as the scepter of contagion from Rome loomed large, with yields in Spain and Portugal climbing to new highs; Brexit-related fatigue meant traders were focusing on a speech by BOE Governor Carney later Friday amid a thin data calendar, while the loonie pared its weekly drop before Canadian inflation. The euro also swung between gains and losses amid pressure on Italian bonds and signs that contagion was spreading to the region’s periphery. The common currency briefly flirted with a two-month low after Italy’s 10-year yield spread over Germany touched the highest in more than five years following a letter from the European Commission to Rome that said its spending plans were excessive. The Bloomberg Dollar Spot Index was little changed after a two- day advance and was set for a weekly climb. The pound inched higher but was set for its first weekly decline in two. The yen weakened on news of China’s growth slowdown. U.S. Treasuries held steady, as did Britain’s gilts ahead of Carney’s speech. Elsewhere, oil recovered from near the lowest level in almost a month. Both WTI and Brent are up over 0.5% on the day, at around USD 69/bbl and USD 80/bbl respectively. This slight increase is likely due to ongoing tension surrounding the disappearance of journalist Khashoggi, and what the US response will be when the investigation finishes. Although, OPEC have stated that prices are likely to decline in the coming weeks as they expect US output to increase. Expected data include existing home sales. Honeywell, P&G, and Schlumberger are among companies reporting earnings. China’s economic growth slowed more than expected in the third quarter, as weak industrial output data and what the government called the "severe international situation" challenged efforts to stabilize the economy and reach its growth targets. Gross domestic product increased 6.5 percent in the three months through September from a year earlier - that’s the slowest since the aftermath of the global financial crisis in 2009. The U.K. and the European Union are inching toward a plan that could help unblock Brexit negotiations, raising hopes of progress after months of stalemate. It involves taking more time to do the deal, but it’s a risky one for May. Members of her Conservative Party have angrily criticized her and Foreign Secretary Jeremy Hunt said cabinet ministers have "lots of concerns." President Donald Trump Twitter feuds and controversies have overpowered the GOP economic message, and his persistently low approval ratings may dash any Republican hopes of avoiding the loss of House seats in the midterm elections less than three weeks away. Saudi Price Prince Mohammed bin Salman is being shunned by investors since the disappearance Washington-based journalist Jamal Khashoggi. U.S. Treasury Secretary Steven Mnuchin withdrew from an investment conference in Riyadh, while Trump warned of ‘severe’ consequences. Asian equity markets were mostly lower following a resumption of the tech-led losses on Wall St where the dampened risk-tone was attributed to various ongoing concerns including higher US interest rates, Italy’s budget deficit, Saudi foul play and the US-China trade dispute. ASX 200 (Unch) and Nikkei 225 (-0.6%) both declined although losses in Australia were stemmed by resilience in gold miners and in the largest weighted financials sector, while Japanese exporters took the brunt of the recent safe-haven flows into JPY. Elsewhere, Hang Seng (+0.4%) and Shanghai Comp. (+2.6%) were both initially negative as the mainland index extended on the prior day’s near-3% drop and as participants digested a slew of tier-1 data in which GDP Y/Y and Industrial Production missed estimates, although losses in the mainland were gradually pared as there were also various announcements from Chinese officials on supporting domestic companies. Finally, 10yr JGBs were uneventful with only minimal support seen from the risk averse tone and paltry BoJ Rinban announcement for JPY 255bln in JGBs. Major European indices are mostly lower, with the exception of the SMI (0.25%) bolstered by Nestle (+1.8%), following an upgrade to buy at DZ bank, and the FTSE MIB (-1%) lagging, with Italian banks adversely affected by the EU Commission’s response to the Italian budget; UBI Banca are halted after falling 5.5%. In terms of sectors, consumer discretionary is the worst performer, down by over 1.5%, due to poor performance by Michelin (-7%), with Continental (-5.5%) and Pirelli (-4.9%) down in sympathy. The utilities sector is leading, supported by names such as National Grid +1%. In terms of individual equities Intu Properties (+11%), following a revised offer from the Peel Group. Bouygues (-9%) are lagging after the company lowered their profit guidance; closely followed by Intercontinental Hotels (-5.1%) as USD 500mln is to be returned to shareholders by means of a special dividend. In FX, the Dollar remains relatively well bid overall, albeit off best levels as the index straddles 96.000 and mtd highs ahead of a key Fib, at (96.155 and 96.236 respectively. However, some G10 counterparts have clawed back losses vs the Greenback on a mixture of pre-weekend short covering, consolidation and hedging against event risk. NZD - The major outperformer, and firmly back above 0.6550 vs the Usd, but mainly on cross flows vs the AUD and the potential for political fall-out from Sydney by-elections. Aud/Nzd has retreated sharply from recent highs towards 1.0800 and Aud/Usd is also recoiling to straddle 0.7100 from 0.7150+ levels earlier in the week (partly on encouraging labour market metrics). Note also, the Aud remains more prone to Chinese impulses and GDP data overnight disappointed. JPY - Mainly weaker within a 112.15-55 range vs the Usd in wake of soft Japanese inflation data overnight and more dovish BoJ policy guidance from Governor Kuroda. EM - The Rand is bucking a broad weaker trend in regional currencies vs the Buck with the aid of hawkish rhetoric from the SARB that indicated rate hikes if CPI rises in line with forecasts. Usd/Zar down to around 14.3375 at one stage. In commodities, gold is marginally up, approaching USD 1230/oz once again staying in a USD 5/oz range; as the market environment is affected by market concerns such as Brexit, Italian Budget and lower than expected Chinese GDP data. London copper is flat at USD 6162/tonne, following it dropping by 1% yesterday; putting copper on track for its biggest weekly drop since mid-August. Both WTI and Brent are up over 0.5% on the day, at around USD 69/bbl and USD 80/bbl respectively. This slight increase is likely due to ongoing tension surrounding the disappearance of journalist Khashoggi, and what the US response will be when the investigation finishes. Although, OPEC have stated that prices are likely to decline in the coming weeks as they expect US output to increase. Looking ahead, the only release of note is September existing home sales. Away from the data the Fed's Kaplan and Bostic, as well as BoE Governor Carney, will be speaking in the afternoon. P&G, State Street, and Schlumberger will report their earnings. Markets were decidedly queasy yesterday as there was a mini perfect storm of bad news to contend with. We had the Italian/EC budget confrontation escalating, Mnuchin pulling out of the Saudi conference, and Spanish banks surprisingly losing a mortgage tax hearing and suffering heavy losses. Italian 10-year bond yields rose +13.8bps to 3.68% - their highest level since February 2014 – as it looks increasingly likely that the European Commission will reject the country’s fiscal plan. Brussels sent a letter to Italy, asking for clarification on several points. While this isn’t unusual, it is the first step on the process which can result in rejection of the budget and eventually sanctions, and the letter was more sharply worded than usual. The letter described the budget as “an obvious deviation” from prior commitments, on an “unprecedented” scale. It noted that the Italian Parliament’s own budget watchdog declined to endorse the plan’s growth projections, which our economists also think are overly optimistic. On the Italian side, Deputy Prime Minister Salvini said that the budget would not be changed by even “one comma,” setting up a potential confrontation. The next week will likely see things escalate further given these tensions, an ECB meeting next week where little sympathy is likely to be given, and also the upcoming rating agency actions. S&P and Moody’s will likely act next Friday which could be a big focal point. In a potentially worrisome signal, the problems in Italy spread beyond the BTP market yesterday. The euro weakened -0.37% versus the dollar and the Swiss franc rallied +0.34% versus the euro on safe-haven flows. 10yr Treasuries and Bunds rallied -2.6bps and -4.5bps respectively. Importantly non-Italian peripheral countries’ bonds sold off in unison, with 10-year yields in Spain, Portugal, and Greece rising +7.8, +8.3, and +11.9bps, respectively. Spain was also pressured by a surprise court ruling which shifted a mortgage tax away from consumers, who used to pay it, onto banks, who will now have to pay it. Spanish bank stocks fell -3.47%, while the Europe-wide banks index closed down -2.20%. Both indexes are at fresh two-year lows. Sentiment deteriorated further early in the US session after news broke that US Treasury Secretary Mnuchin will not attend an investment conference in Riyadh amid the ongoing fracas associated with multiple press reports on Saudi Arabia’s alleged abduction and murder of a dissident journalist in Turkey. Oil fell just over -1%, more in line with the broader risk off. With all this news the S&P 500 fell -1.42% yesterday, the 41st day of the year with a move of +/-1%, after only eight such days in 2017. The VIX again closed back just above 20. The DOW and NASDAQ fell -1.27% and -2.06%, respectively, leaving the three major US indexes each within 0.2pp of flat on the week. Most sectors fell, with consumer discretionary and tech again lagging as earnings failed to boost sentiment as they did earlier in the week. In Europe, the STOXX 600 pared gains of as much as +0.58% to close -0.51%, as sentiment deteriorated during the US session and as the selloff in Italy accelerated. The FTSEMIB lagged further, dropping -1.89%. Corporate earnings were a bit more mixed yesterday, with the tech firm SAP and the cement maker HeidelbergCement both trading lower in Europe after negative reports. In the US, Keybank posted lower-than-expected loan growth, net interest margins, and fees, with the only bright spot a low tax rate. Commentary from BB&T met expectations, but the banks index still fell -1.88% to retrace half of its gains earlier this week. This morning in Asia markets are largely heading lower with the Nikkei (-1.21%), Hang Seng (-0.34%), Shanghai Comp (-0.02%) and Kospi (-0.15%) all down. Markets have bounced off their lows though, especially in China (-1.38% in early trading) as the heads of the PBOC, the banking and insurance regulator and the securities regulator all issued statements overnight voicing their support for the market and promising measures to help ease financial pressures on companies, especially those with a high proportion of pledged shares. The PBOC Governor said in a statement on the central bank’s website that the recent stock market turmoil was caused by investor sentiment. The PBOC is studying measures to ease company’s financing difficulties and will also use monetary policy tool to support banks’ credit expansion. So heavy verbal rather than physical intervention. This comes as China’s Q3 GDP surprised on the downside overnight at +6.5% yoy (vs. +6.6% yoy expected and +6.7% previously). China’s statistics bureau said in the accompanying statement that the downward pressure on growth is increasing with the "extremely complex and severe international situation" and heavy domestic development tasks while, adding the government will work to stabilize employment, finances, exports and foreign investment. 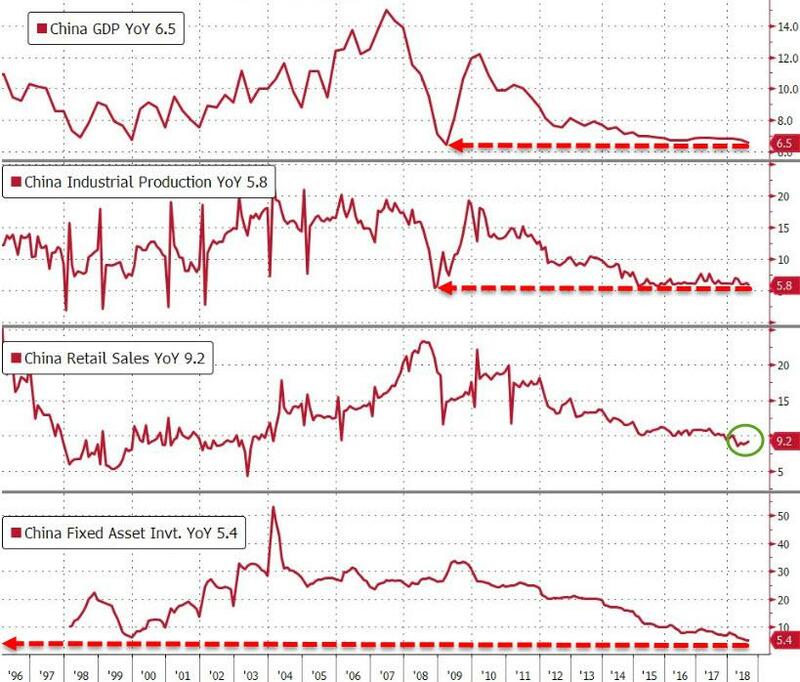 In the meantime, China’s September industrial output stood at +5.8% yoy (vs. +6.0% yoy expected), retail sales came in at +9.2% yoy (vs. +9.0% yoy expected) and YtD September Fixed asset investment printed at +5.4% yoy (vs. +5.3% yoy expected). Japan’s September CPI came in at +1.2% yoy (vs. +1.3% yoy expected), core CPI came in line with expectations at +1.0% and core-core CPI stood at +0.4%, in line with consensus. Elsewhere the Brexit situation continues to simmer, as Prime Minister May talked about “an option to extend the implementation period,” which would delay the politically difficult decisions regarding the Irish border. Deputy DUP Leader Nigel Dodds said that such a plan would do “nothing significant on the key issue,” while the eurosceptic Tory MP Jacob Rees-Mogg said that such a plan is “a poorly thought-through idea.” May has to navigate between these two flanks of her Government, and the next major test could be the budget vote in 10 days time as the DUP have previously threatened to withhold support. There’s lots of additional talk in the press about domestic political dissatisfaction with May’s approach so things remain on a knife-edge here. The pound fell -0.69% versus the dollar yesterday, and DB continue to think the market is underpricing the risk of a political crisis in the UK even if the base case is a deal by year-end. In other European political developments, our EU Policy Research Team put out this preview of next year’s European Parliament elections which is topical given the political upheavals around Europe. Based on the latest polls, the centreright EPP and centre-left S&D would both lose seats, with gains split between the liberals (depending on if French President Macron’s En Marche party joins the alliance) and far-right populists. Net net, EU-sceptics could control more than 25% of seats in the European Parliament, but are unlikely to reach a veto-level majority. However this group could slow down and frustrate pro-European policy if they act in a coordinated manner. To read complete note click here . Elsewhere liquidity in US money markets tightened yesterday, with the 3-month Libor fix rising +2.4bps to 2.469%, its sharpest move since March. There were some idiosyncratic aspects driving the move, such as a large Treasury bill auction settlement, but we think that spreads in money markets (e.g. Libor-OIS and fed funds-IOER) will continue to widen as the fed withdraws reserves and the Treasury expands its cash balance. The odds that the Fed makes another technical adjustment to its rates, i.e. by hiking IOER only 20bps, at the December meeting are rising. On the data front, UK retail sales came in a bit soft, at -0.8% mom versus consensus expectations for -0.4%, the steepest drop of the year. In the US, the Philadelphia Fed business outlook survey printed at 22.2 versus expectations for 20.0, so a shade stronger-than-expected. The survey indicated that capex is running at a strong pace, as Pennsylvania expands its shale oil industry. Price pressures softened, remaining in positive territory but below their readings of most of the year. Initial jobless claims came in line with expectations and the Conference Board’s leading index rose 0.5% mom, consistent with our GDP growth expectations. Looking ahead to today, we get the euro area's August current account balance, Italy’s August current account balance, and the UK's September public finances data. In the US, the only release of note is September existing home sales. Away from the data the Fed's Kaplan and Bostic, as well as BoE Governor Carney, will be speaking in the afternoon. P&G, State Street, and Schlumberger will report their earnings.